We are a leading Manufacturer of li-fi solar portable mobile lighting tower-s3.0p, solar based movable lighting tower and li-fi solar portable mobile lighting tower(s2.4p) from Bengaluru, India. Li-Fi Solar Portable Mobile Lighting Tower-S3.0P includes 4 nos. to 10 Nos DC Floodlight, with solar powered battery bank system and mounted on trailer with outriggers and removable tongue. Our brand new design Solar Lighting Tower, designed and built in India represents energy efficiency at its finest. This 100% Aussie engineered device not only uses zero power (other than the sun! ), it’s completely noiseless and throws out the amazingly powerful light - a minimum 150w LED to be precise! 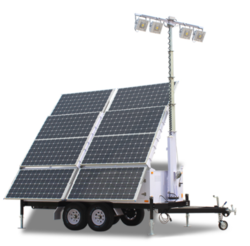 Fully automated, trailer mounted and with an optional backup generator, the Solar Lighting Tower offers more light where you need it, simply and effectively. Designed as a low voltage LED Light Tower, the Portable Solar Light Tower introduces a difference in night-time lighting. Green, efficient, and noiseless lighting can be placed nearly anywhere and is self-maintaining. 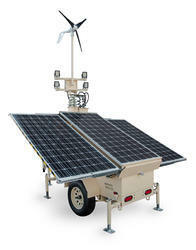 Li-Fi-S Solar Portable movable Lighting Tower includes 4 nos. 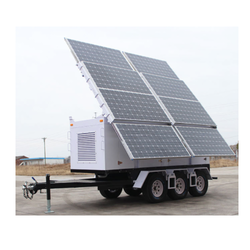 to 10 Nos 150W DC Flood light, with 48V/ 72V/ 96V/ 120V solar powered battery bank system and mounted on trailer with outriggers. Our brand new design Solar Lighting Tower, designed and built in India represents energy efficiency at its finest. This 100% Aussie engineered device not only uses zero power (other than the sun! ), it’s completely noiseless and throws out amazingly powerful light - a minimum 150w LED to be precise! Fully automated, trailer mounted and with an optional back up generator, the Solar Lighting Tower offers more light where you need it, simply and effectively. Li-Fi Solar Portable Mobile Lighting Tower(S2.4P) includes 4 nos. to 10 Nos 150W DC Flood light, with 48V/ 72V/ 96V/ 120V solar powered battery bank system and mounted on a trailer with outriggers and removable tongue. Looking for Solar Portable Mobile Lighting Tower ?